No Man’s Sky may be getting some tools to reduce the impact of interstellar griefers. Hello doesn’t believe the problem of griefing is particularly widespread, finding griefing happens in relatively “isolated” circumstances. But the outlet found a number of stories of players afraid to engage in the multiplayer side of No Man’s Sky Next. Players told of how they needed to persistently kick strangers from their games, lest they lose chunks of their base or face malicious pirates in overpowered starships. PvP activity in No Man’s Sky brings no tangible reward. But with any large multiplayer game comes people willing to ruin the experience of others for the thrill of it. Hello is taking the problem seriously, no matter how sporadic these occurrences may be. 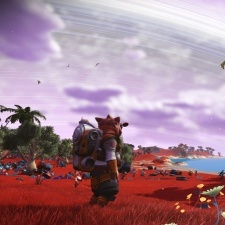 After all, up to 100,000 people are playing No Man’s Sky at once these days, and the game’s seen a recent huge uptick in Twitch viewership. Hello likely don’t want players bouncing off their relaxing space adventure because of one or two bad eggs.